Police said the suspect went up to the victim, pulled out a handgun and demanded the two-month old male pit bull puppies. 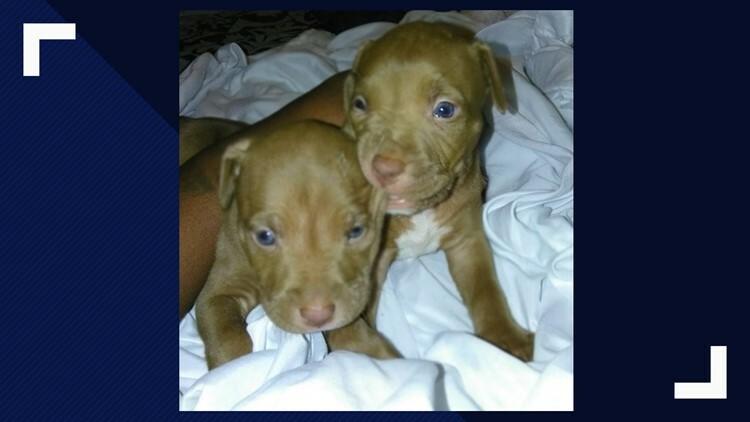 WASHINGTON — A woman was robbed at gunpoint for her two puppies on Sunday in Southeast D.C., police said. The armed robbery happened in the 5100 block of Southern Avenue around 12:07 p.m. when the victim was walking her puppies. The suspect then ran off with the puppies in the direction of 4500 block of Heath Street in Capitol Heights. The suspect is being described as a black man, between the ages of 20 and 30. He is about 5'5" tall and weighs around 130-135 pound. He has a dark complexion, a skinny build and short hair. He was last seen wearing a black puffy coat, black knit cap and black sweatpants. He is considered to be armed and dangerous, police said. One of the puppies were wearing a black collar and the other was wearing a blue collar. Anyone who can identify these individuals or who has knowledge of this incident should take no action but call police at (202) 727-9099 or text your tip to the Department's TEXT TIP LINE at 50411. The Metropolitan Police Department currently offers a reward of up to $10,000 to anyone who provides information that leads to the arrest and conviction of the person or persons responsible for a violent crime committed in the District of Columbia.